The stratospheric cost of American healthcare is dubiously justified as part of a social contract between health-sector corporations and the public: corporations enjoy strong patent protections, and in return they invest time and resources to develop new medicines and treatments. 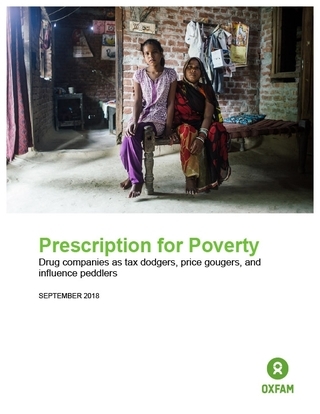 A new report from Oxfam, however, shows that while pharmaceutical manufacturers have unquestionably received the friendly regulatory environment and massive profits they want, they have not delivered the goods, especially when it comes to combating disease in the developing world. The report paints a picture of a set of companies, notably Pfizer, Abbott, Johnson & Johnson, and Merck, that have twisted their financial reports in knots to avoid billions of dollars in taxes and weaponized international trade agreements to influence developing countries’ policies on intellectual property. Although pharmaceutical companies do the majority of their business in rich countries, developing countries are lucrative targets for companies to use their corporate might to stymie competition and keep their drug prices high. The report describes cases where developing countries faced a pressing need for high-priced antiretrovirals, cancer drugs, vaccines, and tuberculosis drugs. When those countries’ governments attempted to act through the World Trade Organization to, for example, enact compulsory licensing as a means to introduce competition and lower costs, companies exercised their influence in the United States to place the offending governments under sanction until they capitulated. On the other end, the report indicates, pharmaceutical companies have taken steps to hide their profits in low-tax countries, sapping billions in revenue from the governments that invest in the science that drives their products and safeguard the patents that undergird their business. Pharmaceutical companies made use of a familiar battery of methods to exploit the international system this way, including inversions to disguise an American company as a foreign one and passing profits into low-tax jurisdictions through artificial usage fees on intangible assets like intellectual property. The companies analyzed in the report experienced suspiciously skewed profit margins across high-tax and low-tax countries, claiming profit margins of 5 percent and 7 percent in the developing world and the developed world respectively but 31 percent in tax haven countries. As a result, Oxfam estimates, these companies paid $112 million less than they would have in the developing world and $3.7 billion less than they would have in the developed world assuming that all their profits received similar tax treatment. While this revenue loss is troubling enough in a country like the United States, for countries like Kenya and South Africa such a budget hole can be catastrophic. The report finds, for example, that the $112 million denied to governments in the developing world could have bought HPV vaccines for two out of every three girls born in 2016 in Chile, Colombia, Ecuador, India, Pakistan, Peru, and Thailand. The report vigorously critiques the notion that pharmaceutical companies’ profits have benefitted society through innovation, showing that companies have funneled a greater share of their profits to investors through dividends and stock buybacks than they have invested in research and development, and they have spent far more on marketing than they have developing new drugs. The report calls for governments to reform the tax system that allows multinational corporations to shield their profits. In particular, Oxfam advocates country-by-country reporting so that government agencies and the public can see how much money multinationals make, where they make it, and how much they pay on it in taxes. It also recommends measures to curb tax haven abuse. The United States should lead the way on cracking down on tax havens and the multinational corporations who use them by embracing country-by-country reporting and reforming its international tax system so that companies no longer have the incentive to shift their profits into tax haven jurisdictions. Insofar as these policies shore up government budgets in developing countries, they can strike public health crises at the root, giving those governments the resources they need to build infrastructure and provide medicine to those who need it the most.